Harry N. Abrams, 2016. 978-1419719066. Synopsis: It was over. After our last adventure, there wasn’t supposed to be a Quikpick Adventure Society. But Marilla was bent on delivering justice for her family…for the thousands of slaves that had to suffer under the hand of their masters. And when a pretty girl is goading you and calling you a wimp, well, what choice did we have? So here it is; the last and final adventure…for real this time. Why I picked it up: I wanted to know how the last adventure ‘ended’. Why I finished it: And so, things have come to an end. For real this time. Well, I am sure there will still be excitement and adventures, but nothing quite so fantastic as before. The trio has certainly grown since we first met them, and they will keep going on even though there are no more reports. I do have to admit that the premise for the last adventure is a little bit odd. Then again, I’ve mentioned before that I’m not the kind of person that would intentionally seek out the strange and abnormal – I’m more of a Dave than a Marilla or a Lyle. But these sort of experiences are the ones that make a lasting impression on the characters and on the reader. The things we do with our friends, no matter how weird or crazy they may seem to others, are what bring us together and strengthen our bonds. They are the things that we will remember and look back on years later. Angleberger has given us a story about the power of friendship and the strange nature of change. Our lives evolve in unexpected ways as we get older, a fact that becomes apparent to Lyle at the close of the report. It’s not always good or bad, but it happens. Wang’s illustrations help add to the humorous nature of the story and they play off the sort of silliness that is inherent to Lyle, Dave, and Marilla’s friendship. It’s a somewhat serious end to the series, but it does give the reader some comfort knowing that the trio continues to carry on, even in the face of change. Synopsis: This is the true record of the first adventure of the Quikpick Adventure Society. Society might be stretching it, since there are only three of us, but adventure is definitely stretching it. 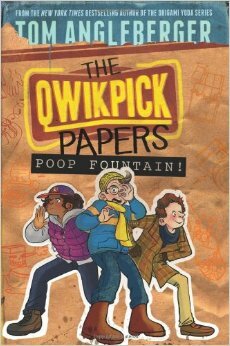 All we wanted to do was investigate the poop fountain at the local sanitation plant based on this article I found for a school assignment. The other option was opening the mysterious barrel of Banana Puree behind the empty old Kroger store. And what we found, well, you’ll have to read the report to find out. Why I picked it up: I love, love, love the Origami Yoda books and the title reminded me of Dickens’ The Pickwick Papers. Why I finished it: This book has just the right balance of adventure, mystery, and the completely disgusting. Since Lyle and his friends Marilla and Dave don’t have anything to do on Christmas Day, they decide to sneak into the local sanitation plant to see the mythical poop fountain. Because they can’t just sit around at the local Quikpick all day while Lyle’s parents work. That would be way too boring. Plus, it’s Christmas, so the plant is closed anyway, and it’s not like there’s anyone around to bust them for sneaking onto private property. It makes me nostalgic for the days when my parents were too busy to wonder what I was up to…which was never, but readers can dream, can’t they? The report, as discovered by Angleberger, is a story about kids like us that are in search of a cure from the everyday. They want to be able to go out and do something fun in a town that’s, well, boring. Especially when you’ve pretty much done everything that is worth doing. I like Lyle as a narrator because we can relate to him: we remember how hard it is to make friends, we remember how it is to compete with someone over a crush, we remember wanting to discover something awesome about which we could never ever tell our parents. Complete with Polaroid pictures and unofficial personal notes from Lyle, the first volume of the Quikpick Papers is guaranteed to delight fans of Angleberger’s other works and bring other fans into the fold. Plus, it’s a quick read that inspires us to discover something unexpected about the places in which we live. Synopsis: Seventh grade promises to be great, but when Harvey comes to school with a folded Darth Paper bent on undermining Origami Yoda, things start to go bad fast. First, Dwight is suspended and Origami Yoda is trashed. Then, Tommy and his friends hear that Dwight might get expelled and sent to a remedial school because he disturbs the learning of the students. 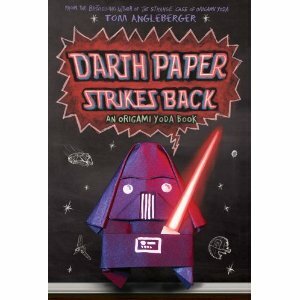 Darth Paper is quick to support the dismissal of Yoda and Dwight, but Tommy is still convinced that they need Origami Yoda. Can he and his friends gather enough evidence to keep Dwight from getting expelled? Why I picked it up: I liked the first book so much I wanted to read the second one. Synopsis: Tommy and Dwight aren’t exactly friends and Dwight isn’t exactly cool, but he knows how to fold origami. One day, Dwight folds an Origami Yoda and convinces Tommy and his friends to ask it questions – and the advice turns out to be good. Really good. Almost too good. Soon the whole school is coming to get advice from Dwight’s Origami Yoda. But when Tommy asks Origami Yoda about a girl, will he take Yoda’s advice or listen to his friend Harvey who tells him it’s only a piece of folded paper? Why I picked it up: Yet another recommendation from a library school classmate. Also, I love Star Wars and origami. Why I finished it: It’s hard to say what I love more about this book: Angleberger’s ability to connect with the middle school audience or the dichotomy between dweeby Dwight and the brilliance of his Origami Yoda. Every middle schooler wants answers about how to deal with their teachers, their friends, other students, and whether or not they should ask that certain someone to the school dance. While Tommy isn’t spending a lot of time trying to fit in, he gradually begins to see that Dwight is trying to fit in with his peers, even if it seems to be by rather supra natural means. I have to admit that I alternated between thinking ‘this is cool!’ and ‘how is this possible?’ like Tommy, but in the end, I think as unbelievable as things are, I’m willing to suspend disbelief. Angleberger’s story shows that as awkward as middle school is, there is a way to get through it, and finding those people that will believe you and support you no matter how weird you are can definitely make the difference. It proves that even those people you didn’t think were worth knowing or noticing have something to offer.